A series of helical crack stitching bars are retrofitted into cracked walls to reconnect walls on either side of a fracture. The high-tensile stainless steel reinforcement bars are bonded into slots that extend 500mm either side of the crack to permanently strengthen the masonry and stabilise the structure within the cracked zone. How does brick stitching work? Helical reinforcement bars have a deep interlocking helix that provides an excellent bond when used with high strength polymer-modified grout to stitch brick and masonry walls. The bar and grout combination stitches across the cracks to hold the fractured wall together and to increase both the tensile and shear strength of the brickwork. 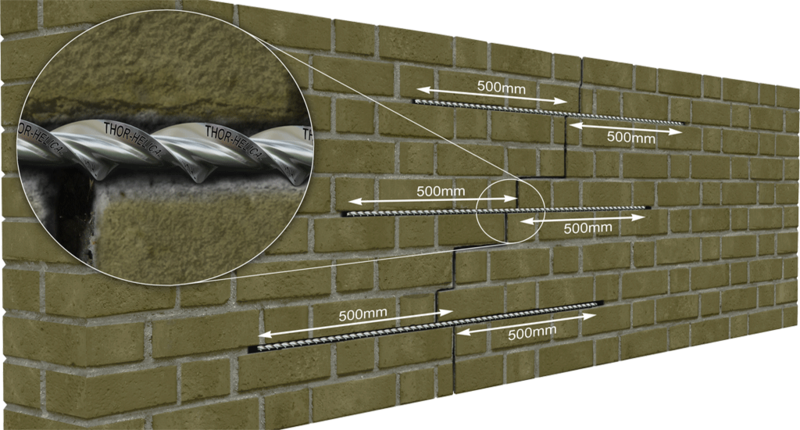 Helically twisted bars have a unique torsional yield characteristic that absorbs stress and disperses the load along a greater length of the wall. The bars accommodate normal thermal and moisture movement and provide great resilience to future cracking.